It’s often said that connections are currency – and when it comes to relationship-building, there’s one mistake entrepreneurs often make: not following up. Whether it’s with a potential sale on the line, or just a fellow colleague who might be a great collaboration source for you, follow-up is huge. If you’re not following up through emails or phone calls, you’re missing out on gaining clients, nurturing relationships, and growing your business. For a lot of us though, follow-up doesn’t feel fun. We can approach it with a sense of drudgery, or we might even get sweaty palms and butterflies in our stomachs. The good news is that there’s a better way to follow up. Here are some tips to make following up easier for you and more likely to get the results you need to build relationships that will grow your business. Just want the templates? Jump to them here! How often do you go to an event and collect business cards, then leave them sitting around for a few days, weeks, or (yikes!) even months? Not anymore. Schedule follow-up in your day, because connections are currency. And most likely the people you’ve given your business card to will not follow-up with you (unless you have something that they really want). Nine times out of ten, when I’ve been in situations where I’ve given someone my card and they didn’t have one to give to me, they’ve never followed up. If you can, make it a practice to follow-up IMMEDIATELY following the event. And I’m dead serious about this. Have your laptop with you and when you leave the event, hop on to some nearby wifi (or use your own hotspot) and start drafting emails. You don’t have to send them until the following business day (or you can really surprise people and send them immediately), but at least get them drafted. You’ll still be excited about meeting them and your emails will have a good energy about them. Do you know why this step is so important, and why I like to do it before I even get home? Because home equals distractions. Kids, laundry, Facebook, dinner prep. Once I walk through the front door of my house, the chances that I’ll be able to follow up are zero. Decide BEFORE you attend an event WHEN you will follow up with your new friends, and schedule it. Just make sure that you make space for it in your business life. Never just “check in.” There’s no value for either side by “just checking in.” If a potential client opens an email from you that’s just filler, they may not open one later that has more substance and a call to action. And, for those people you want to build relationships with, a general email won’t be memorable. Having a reason also makes the email or phone call flow more smoothly. You can reference a recent meeting (this helps jog their memory, too); see if they have any questions about an info sheet you sent; or include an interesting article based on a previous conversation. They’ll appreciate you not wasting their time and that you’re adding value to the relationship. One key to relationship building and successful follow-up is to connect with people in very specific ways. When I meet people, I am always looking for that bridge to them, that connection. Maybe we have kids the same age. Maybe we both speak a foreign language or have lived abroad. Maybe we’re both into makeup or pop culture. There’s *always* a way to connect with people. So when you’re initially talking to someone, find this connection. Then use it when you follow up later. You can also build up your general knowledge about the person or business. The more you know, the more specific and effective your email or phone call will be. Gather as much information about them as you can from social networks, their website About Us page, and conversations you have with them. Add each piece to their Contact Record in your Customer Relationship Management (CRM) platform so you can easily find it when you’re ready to do your follow ups. Keeping notes on your clients, colleagues, and friends is one of the highest return on investment activities that you can do. A little work after your meetings could pay off in spades later. Yes, it’s tedious and there are all kinds of passive barriers, but remembering the details of your clients and colleagues will separate you from everyone else. It will make it easier to create the right message when you’re following up, and they’ll be impressed when you show that you understand them, their business goals, and their challenges. Holidays and changing seasons are great times to follow up and let people know about sales or specials you’re running. These work especially well to minimize awkwardness when you haven’t been in touch for awhile. Other ideas for running promotions are changes to your business such as new products/services; expansion of your business location, or moving to a new one; business anniversary, etc. Make sure you don’t lead with the promotion. Use the data you already have to let them know why you believe the product/service will help them, and add value where you can. This goes along with scheduling time for follow-up. Block out enough time to do as many follow-up emails or calls that you can at once. It’s easier to do this type of work in chunks of time, especially if you find yourself procrastinating, avoiding it, or even dreading it. I find that once I’m in a “follow up” mindset it’s better to knock out as many calls or emails as I can. Don’t get distracted and answer any emails during this time – even if someone responds to your follow up email. Close Facebook and Twitter while you’re following up. Focus on sending your messages before doing anything else. I like doing the emails first and then phone calls. Find the combination that works best for you. Do you hesitate to send that email or pick up the phone because you’re afraid you’re “bothering” the person you’re reaching out to? Through years of experience, I’ve learned that the reality is that if you have qualified your potential clients, the majority of people you contact want to talk to you. They want to hear what you have to say and learn more about how your business can help them. If you don’t hear back, your email may have gotten lost in the crush of their emails. They may be your number one priority, but you are certainly not theirs. However, they still want to hear from you. If you don’t get a reply from your first email, don’t be afraid to reach out again after 3 – 5 days. I’ve learned that most people will appreciate a second follow up. Many people who became clients have told me they’re glad I reached out again because they wanted to work with me. I hope you found these tips helpful for your next round of follow ups. If you want to see some real examples, we’ve put together some amazing email templates for you. Using the tips in the blog post, you can easily create follow up emails that are relevant and targeted. Included in this PDF are sample emails for following up with potential, current, and previous clients that you can edit to fit your business needs. Anything in [brackets] should be edited and the brackets removed. Templates are available as text here in this blog post and also as a downloadable PDF. after a networking event, potential client, current client, previous client, speaking or collaboration, and review/testimonial requests. To download a PDF of the templates, click here. It was nice meeting you at the [Event Name]. I’d love to learn more about your business and see if there’s anything I can do to serve you. Would you want to chat sometime? We could do phone or meet in person. I hope we can chat soon! I received your message through [my website contact form, email, LinkedIn, etc]. Thank you for the kind words about [use this sentence to reference anything the person said when they reached out]. You noted that you’d be interested in [x product/service]. I have three options for that. I looked at your website and business social media to see what would probably be the best fit for you. Here is my recommendation [explain why and link to product/service]. Here’s a link to my testimonials [add link] as well so you get a feel for how others have used it and the results they’ve seen. If you’d like to set up a time to talk about this further and so I can answer any questions, please use this link to schedule a 30-minute call [add scheduling link]. I look forward to chatting with you about how I can help you! Read through existing documentation and your website to better understanding the processes you’ll need. I’ve created this shared Google folder where I’ll add each process document when it’s ready for your review and edits [ADD LINK]. I’m 90% done with each of the first 3 processes listed in the All Processes doc. I’ll finish the processes for onboarding clients and launching a new product this week. We’ll schedule a call for next week to go over the completed processes and make edits. Please let me know if you have any questions or need clarification on any of the above. I hope all is well with you and [XYZ Business] as we head into Spring! I really enjoyed working with you on your website copy last November. During one of our conversations you mentioned that you would love [Insert service or product] for your business. I’m following up to let you know that it’s now available. If you’re still interested, here is the link with more details [insert link] If you have any questions or recommendations on how to make it more useful. Happy New Year! I hope that 2017 is off to a great start for you and Launch Workplaces. And that’s after just one 90-minute session! I’d love to be able to provide your members with the same feelings of being less stressed and more focused, organized, and motivated in growing their businesses. I’m available on March 7th from 1:00pm until 4:30pm if you’re free for about 30 minutes to discuss this further. It was great meeting you at today’s Free Business Process Workshop and learning more about your graphic design business. I really enjoyed helping you with your lead generation process and loved seeing the progress you made! I was reading through the surveys from the workshop and I want to thank you for your feedback. I love hearing that you felt clear and purpose-driven after the workshop. I’m making a conscious effort to get more reviews on my Facebook Business page. When you have a moment please visit my Simplified Business Workflows Facebook page and click the Reviews tab on the left. A rating would be great, but if you have time to leave a few words about me or the workshops I’d greatly appreciate it. 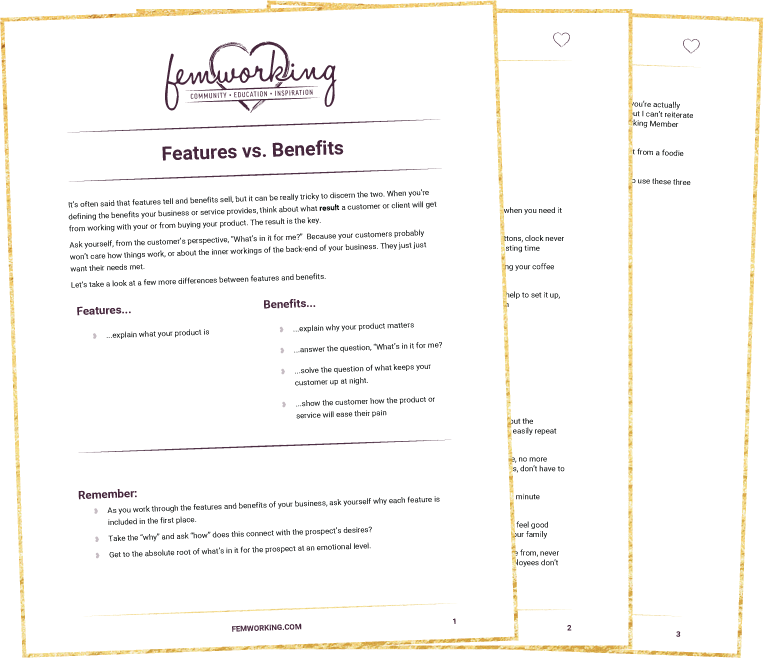 We hope you these templates make it easy for you to follow-up so that you can gain clients, nurture relationships, and grow your business. Lisa Shaughnessy is the Director of Leadership for Femworking. She also has her own business helping small businesses create powerful and personalized follow up messages to gain clients, nurture relationships, and increase revenue. She runs an active Facebook Group for business owners who want to add more clients and retain current ones. When she’s not helping small businesses reach their full potential, you can find her working out, playing golf, traveling and having way too much fun with her husband Rob, son Kevin, and friends.